No matter where you were born, chances are good that you’ve had Chinese cuisine before. There are thousands of dishes that can be classified as Chinese food, but did you know Chinese food can actually be broken down into eight unique cuisines? Just like any country, food in China is different by region and province. In China, many cities even have their own special dishes! However, overall, Chinese food can be classified in the following eight categories: Lucai, Huicai, Xiangcai, Mincai, Sucai, Zhecai, Chuancai, and Yuecai. Lucai is the perfect food for a sodium junkie who loves seafood. You’ll typically find Lu Cuisine around Shandong province, which is in the north east of China. Shandong people love vinegar and salt and braise their food. 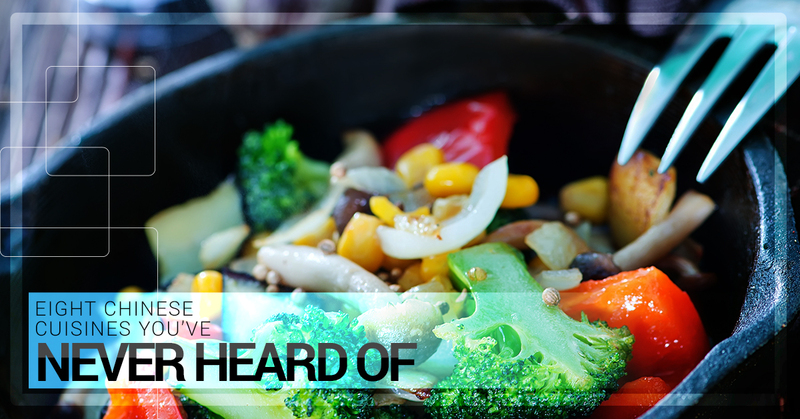 Most people in the north also eat their vegetables and meat with noodles instead of rice. If you’re in Beijing, you’ll see lots of roast duck, and other popular Lu dishes. Mutton and pork dominate in the north of China. Hui Cuisine comes from Anhui province, which is an inland province on China’s east coast and well known for its lush, green surroundings. You’ll find all kinds of herbs and wild vegetables growing around the hills and mountains of Anhui and other wildlife, which makes their food extremely unique to this part of China. Hui cuisine uses a good deal of pork and ham. If your typical breakfast involves eating some kind of noodles and meat with hot peppers and garlic, you will love Xiang cuisine from Hunan province. Hunan is also inland but farther south than Anhui. Although Sichuan is the most well-known province in China for spicy food, Xiangcai can get even hotter and most Xiang foods are more sour than sweet. If you want excellent presentation and smoked and cured dishes that have a lot of zing, order Xiang dishes. After all that hot food from Hunan, take a break and visit Fujian, a coastal province on the eastern seaboard. The food in Fujian is quite mild and slightly sweet. Being right next to the ocean means lots of seafood and sea vegetables are used, but they also utilize many varieties of river fish. Mincai uses a lot of mushrooms and bamboo in their dishes. Min chefs focus on cutting their seafood in a way that brings out the most flavor. Jiangsu province sits to the north of a city everyone knows, Shanghai. The food here is salty and sweet and usually quite healthy. Like most Chinese cuisine, Su dishes use a lot of seafood and local vegetables such as bamboo, water chestnuts and lotus. A foreigner-favorite Su dish is Sweet and Sour Mandarin Fish. Zhejiang is a coastal province that borders the south of Shanghai. Zhecai incorporates all kinds of seafood and sea vegetables in their cooking. Zhejiang chefs spend most of their time prepping the food so they can keep cooking time to a minimum to ensure the food tastes fresh. If you can’t handle spicy food and want a more refined dish, choose Zhe cuisine. Zhejiang is known as the land of fish and rice. Chuan cuisine is popular in Sichuan province, home of the panda. Chuancai uses tons of hot peppers and peppercorns as well as ginger and peanuts. Chuan dishes are more numbing and less oily than Xiang cuisine. What Chinese restaurant abroad doesn’t serve Kung Pao Chicken? If you have trouble remembering the differences between China’s 8 cuisines, just remember Sichuan food packs a spicy punch or a “POW” like their Kung POW chicken. Yuecai is found in Guangdong province, which is just north of Hong Kong. Guangdong is the home of dim sum and morning tea. Most dishes are sweet or lightly seasoned. You’ll also find lots of seafood in Guangdong. Most of the Chinese cuisine that you find abroad is Yue Cuisine, also known as Cantonese food. In addition to dim sum, those bamboo baskets of steamed goodness, Guangdong desserts and drinks are known for using everyone’s favorite tropical fruits such as mango, durian and coconut.